We are thrilled to announce that Floris Books is Scottish Publisher of the Year! 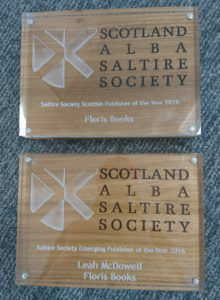 The Saltire Scottish Publisher of the Year Award, which is initiated and administered by the Saltire Society and funded by Creative Scotland, was presented at last night’s Saltire Society Literary Awards where members of the Floris team anxiously awaited the news. The judges congratulated Floris on a “stellar year”, commending their expansion to 15 staff members, international rights deals and success in the Blue Peter Book Awards, Scottish Children’s Book Awards and Scholastic Laugh Out Loud awards. Winning Scottish Publisher of the Year is the pinnacle of what has already been an exciting year for the Floris team. In 2016 we celebrated our 40th anniversary with a fun-filled summer party; settled into our new home (an office with views for miles! ); had one of our hilarious books short listed for the funniest prize in children’s literature and jumped for joy when one of our books appeared on a famous TV programme when it won the Blue Peter Book Awards. 2016 is the fourth time that Floris has been shortlisted for the Scottish Publisher of the Year award (we were commended twice!) and it’s thrilling to finally take home the trophy, particularly when we were up against such stiff competition. 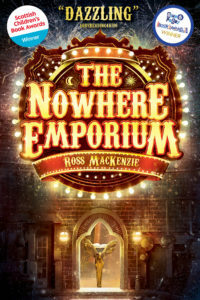 Fellow publishers Black and White Publishing, Saraband, Birlinn and National Galleries of Scotland were all shortlisted, any of whom would have been a worthy winner of the title. We are honoured and privileged to be in their company. On the same evening The Saltire Society’s announced the winner of a new award Emerging Publisher, for talented people working in the Scottish publishing industry. Our very own Design & Production Manager Leah McDowell took home the inaugural award. We’re incredibly proud of her achievement. We’d like to thank the Saltire Society, Creative Scotland and the judges for this amazing endorsement of our hard work. But this could have been achieved without the hard work of our staff, our incredibly talented authors and illustrators and the support of our readers – so thank you. For a blow-by-blow account of the night, you can read our Storify here.